Worry has been expressed over possible ecological damage that harvesting might cause to Upper Klamath Lake. Fortunately, blue-green algae are amongst the most prolific organisms on Earth - reproducing every twenty minutes when conditions are right. This means that the algae harvested from the lake is easily replaced by the following day. More information is shown below product list. 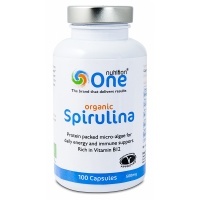 One Nutrition Spirulina helps you achieve your goals. 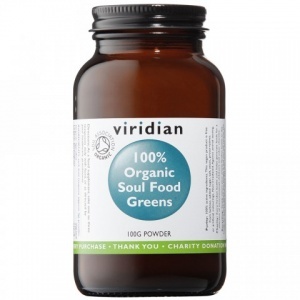 Spirulina is easily absorbed by the body, ensuring you get the full benefits from all its nutrients. 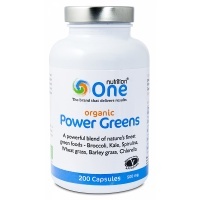 Nutrient and chlorophyll-rich green food powder. Why is it that many people find wild Upper Klamath Lake algae so much more potent than artificially cultivated varieties? Spirulina, after all, has a somewhat similar nutritional profile. First, this wild algae has to survive the very harsh Oregon winters, which kill off weaker organisms, selecting only the hardiest and healthiest to spawn each new generation. Cultivated varieties, by contrast, have a pampered existence. The exceptionally high mineral concentration in Upper Klamath Lake from volcanic ash, also gives the algae a unique spectrum of minerals and trace elements - nutrients that algae growers might never consider adding to their vats or pools. Second, Upper Klamath Lake algae has an unparalleled range of pigments, which act as powerful sunscreens, allowing it to thrive in light intensities that would be injurious to other species of blue-green algae. Finally, many spiritually-minded people believe that Upper Klamath Lake, which is close to the magical Mount Shasta, is a powerful planetary energy spot and therefore the algae in the water is imbued with "cosmic vitality". Upper Klamath Lake Algae contains 60% high-quality protein, weight for weight more than any other food, and with an amino acid profile that closely matches the needs of the human body. Klamath Lake Algae contains a little of almost all the vitamins and minerals needed by the body, including invaluable trace minerals. It's the highest vegetable source of vitamin B12 - often deficient in vegetarian diets - and unlike the B12 in some spirulinas, Upper Klamath Lake algae's B12 is totally usable by the body. This algae contains a host of pigments currently the focus of research into new treatments for cell abnormality. These include carotenoids, phycobilins and phycocyanins. Klamath Lake Algae is remarkably high in both cis and trans forms of beta carotene (provitamin A) - a proven immunity booster and powerful antioxidant. It also contains 16 other carotenoids. It's the richest known source of chlorophyll - a cell regenerator and blood purifier. The algae is enzyme active, allowing for maximum absorption at no cost to the body's own enzyme reserve. Klamath Lake blue-green algae consists of a glycolipoprotein complex, making it easy to digest - unlike the cellulose found around most other plant cells. The algae contains the building blocks of neuropeptides, thereby helping to nourish nerve cells and enhance brain activity. Klamath Lake algae is a source of nucleic and fatty acids. Its carbohydrates and proteins are in forms that are easy for the body to assimilate and metabolize. The algae is strongly alkalizing - it counteracts the acidity of modern diets. Klamath Lake algae contains only 4.2 calories per gram. It's 100% vegetarian, and a wild, organic wholefood. Algae have supported most of the life on Earth for three and a half billion years. You do not get better product testing than that!